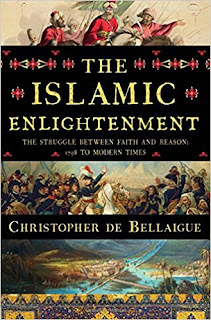 Irtiqa: A Fascinating New Book on "The Islamic Enlightenment"
A Fascinating New Book on "The Islamic Enlightenment"
De Bellaigue, a journalist and author, focuses on three Islamic cities in the first half of the book — Cairo, Istanbul and Tehran. In each, the rulers attempted to adopt elements of Western modernity. Egypt’s nominal suzerains, the Ottoman sultans, had in fact begun reforms before the period covered by this book, but progress was slower in a sprawling multifaith empire in which there were many more interest groups to reconcile than in Egypt alone. In Istanbul, the sultan succeeded in using French military advisers to reform the army and destroy the reactionary Janissaries. The introduction in 1836 of quarantine and other preventive measures against plague, which had hitherto been treated with fatalism, changed people’s life expectancy, and saw plague eradicated by the 1850s. 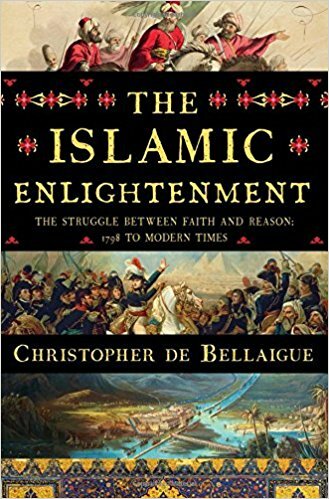 “The Islamic Enlightenment” introduces us to a fascinating gallery of individuals who would grapple with reform and modernization in theory and practice over the next two centuries. Efficient guns, training in modern drill, factories, machines and bank loans were tools for the entry of Muslim states into the modern world, but they were not value-free. Rising levels of literacy, with the introduction of printing, allowed a press to flourish, in the European mold — but rulers in Istanbul found the means to control them could also be imported. The first censorship law was based on similar edicts issued by Napoleon III. The growing complexity and interdependence of society and economies changed the way government was viewed, and the development of a literate bourgeoisie created people who thought about such things, focusing attention on the need for constitutions. That they often fared badly was hardly a surprise — by the time the Ottoman sultan agreed to grant a constitution in 1876, France had already run through 12 of its own. Reactions were further complicated by the persistent pressure of the West on the resources of the Islamic world. Autocrats saddled their countries with profligate loans. The shah of Iran actually sold the resources of his country to Baron Reuter in 1872, an act of such egregious self-interest that it was undone by popular demand and international outcry, while the Ottomans were humiliated by the imposition of a foreign-staffed debt administration and the British occupied Egypt, effectively on behalf of European bondholders, in 1882. There were plenty of people in the Islamic East who could read Darwin and conclude, like the Egyptian feminist Qasim Amin, that natural selection impelled Europeans “powered by steam and electricity, to seize the wealth of any country weaker than them.” And while many others felt that their values — Islamic values — were threatened by the soullessness of the machine age, a multifaceted and slippery Sunni cleric, Jamal al-Din Afghani, was able to articulate some Muslim responses to modernity in ways that were distinctly modern, involving wreaths of cigar smoke, opera seats, international travel and a bulletin for the doctrine of Pan-Islamism called Firmest Bond, which was sent out, like an email newsletter, free of charge to every influential ruler or opinion maker in the Middle East. Islam, Jamal said, required its Luther. One candidate for the role might have been the Egyptian Muhammad Abduh, who proposed a return to attitudes from the time of the salaf, the ancestors — not, as the term is used today to describe salafism, a fundamentalist religious outlook that denies the importance of reason, but as a creative moment in which, in Abduh’s view, any educated Muslim with the Quran could think out his position for himself. Abduh, like Attar a century before, was swept aside by a concert of vilification. The book does not focus on India at all. Otherwise, I think that would have made an interesting case of these debates directly in a British colony. Nevertheless, this is fascinating book with lots of good information. You can read the full NYT review here.